I currently use a number of specialized, standard mixes for growing rhododendrons from the propagating stage to the final mature plant. After some trial and error, I consider these mixes superior to alternatives which I have tried, at least under the particular growing conditions which I use. These notes have two aims; firstly to encourage those who are having difficulties in propagating or growing rhododendrons to try these mixes, and secondly to encourage successful growers to write about their mixes so that comparisons can be made. Numbers 1, 3, 4 are propagating mixes used for sowing seed, rooting cuttings and pricking out seedlings. Number 2 is a mix which stores well and is used as a base for making up other mixes. Numbers 5, 6 are for growing on. Numbers 7, 8 are for growing the mature plant. All but number 8 are artificial container media (1). 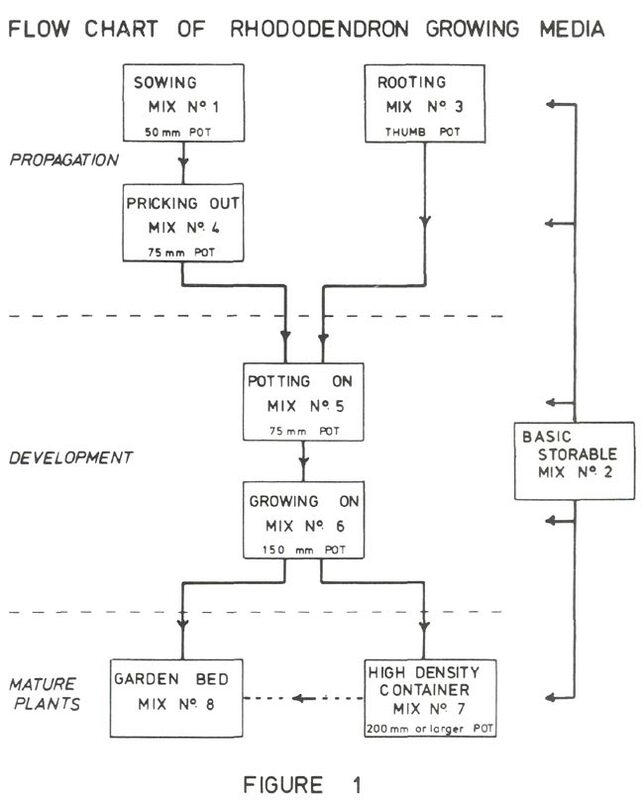 Figure 1 shows a flow chart for rhododendrons in these mixes starting with seed or cuttings and ending with the mature plant. A common characteristic of all these mixes is that the drainage is excellent, the pH is in the range 4 to 6 and the soluble salt concentration results in an electrical conductivity in the range 0.01 to 0.1 Siemens m -1 . It is most important that the growing media for rhododendrons is acidic and stays acidic. 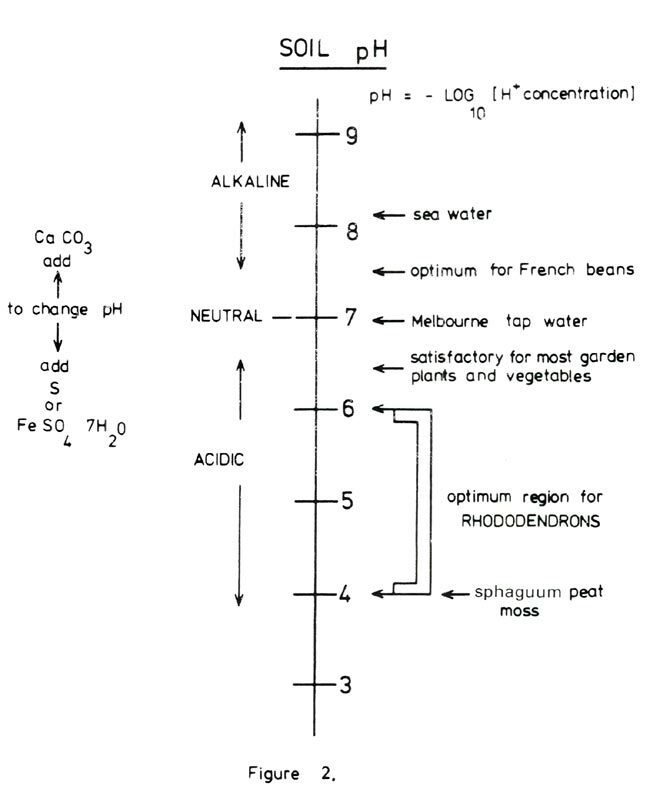 Figure 2 shows the pH range for soils and includes Melbourne tap water and sea water for comparison. The optimum region for most rhododendrons is in the range 4.5 to 5.5 with some rhododendrons liking the soil more acid than others. It is also essential that the soluble salt concentration in the medium is not too high. High concentrations can occur due to the presence of excessive fertilizer or unwanted salt contaminants such as sodium chloride. 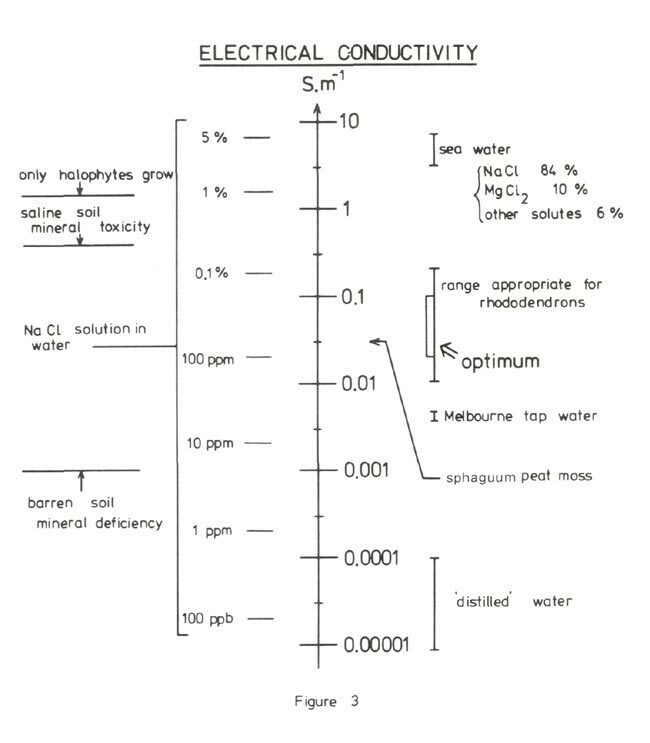 The convenient way of determining soluble salt concentration is by measuring the electrical conductivity of a solution extracted from a saturated soil paste. Figure 3 shows the optimum range for rhododendrons, the chart itself ranging from 'distilled' water to sea water. Salt build up in the container can be controlled to some degree by ensuring that when watering 10% to 20% excess water drains out the bottom. It is my opinion that perfect drainage with the resultant aeration that allows an abundant supply of oxygen to the roots and no chance of water logging is the way to minimize the devastating effect of the fungus Phytophthora cinnamomi on rhododendrons grown in containers or in the ground. Phytophthora is the most serious disease affecting rhododendrons the majority of which are susceptible to the fungus under normal growing conditions (2). It has also been suggested that sawdust should be avoided in the mix (3) and that the presence of bark may increase the resistance of the plant to the fungus. Perfect drainage is, I suspect, also inimical to the development of the pathogenic 'honey fungus' Armillaria mellea which is prone to attack mature plants (4), (5), (6). Both Phytophthora and Armillaria are present in Australian forests (7). Phytophthora is a serious pathogen of some 500 species of Australian native plants and is readily spread by man's activities. There is some uncertainty whether it is a recent introduction or an ancient immigrant (8). Armillaria plays an important role in breaking down dead plant material, it spreads from dead tree stumps and appears to be less damaging than Phytophthora in our forests. For some reason, Armillaria apparently presents less of a problem in Australian gardens than in English gardens. The destructiveness of both fungi is greatest where the soil is infertile and poorly drained. I do not intentionally encourage mycorrhizal fungi (9), (10), (11), which are usually lacking in artificial mixes. Mycorrhizae may be beneficial or essential to the health of the rhododendron in its native habitat under conditions of low available nutrients, but for the home grower where nutrients tend to be present in ample quantities, if not in excess, mycorrhizae may perform no useful function. However, it is possible that the presence of certain mycorrhizae inhibit the development of pathogenic root infecting fungi (12), and in the particular case of rooting cuttings it is possible that mycorrhizae enhance the rooting (13). It is of interest to speculate whether inoculation of the medium with an appropriate mycorrhizae would result in improved vigor of small seedlings, particularly those Vireya seedlings which stagnate. Mycorrhizal seedlings might also result in stronger and healthier plants. A recent review of the importance and effectiveness of mycorrhizal inoculation in nurseries is given by Trappe (14). The above mixes are standard and only in exceptional cases, such as R. saxifragoides , do I give rhododendrons anything but one of these growing media. This is partly a matter of convenience and partly to ensure that variability in the development of the plant is not due to unknown variation in the mixes. This mix consists of sphagnum peat moss put through a 6 mm sieve and made thoroughly wet. No nutrients are added. I use this mix for sowing Asian and Vireya rhododendron seed. Moist, sieved peat moss keeps well and I maintain a supply on hand. I sow the seed on the mix in 50 mm square plastic pots which have been disinfected, and water the seed in with standard strength Thiotox or Captan. Neither of these fungicides adversely affect germination. The pot is placed in a container with water in the bottom end covered with glass (15), (16), (17). With or without fungicide, cleanliness is essential. The seed is illuminated with natural light by day after passing through Tuflite and by night with fluorescent lights to make a total of 18 hours of light. I aim to keep the temperature in the range 20° to 30°C (68° to 83°F.) during hours of light and 10° to 20°C (50°-68°F.) during darkness. The purpose of putting the peat moss through a sieve is so that the seedlings are easy to separate when they are being pricked out. It is, however, necessary to keep in mind that the physical treatment of peat deteriorates if roughly handled. This detrimental change in its characteristics can be demonstrated by putting it through a mincer. No fungus should appear if the system is clean; if it does, it is usually due to chaff which can be removed with tweezers. The seedlings are completely ventilated in one go once the cotyledons are fully developed. Once ventilated the seedlings are misted with a fine spray once or twice per day taking care to make sure that their leaves are dry when darkness falls. Damping off fungi, such as Botrytis, do not develop if the air in the propagating frame is kept in motion and the leaves dry at night. The seedlings are watered with 10% normal strength Aquasol once per week. Alternative mixes which I have tried include powdered pine bark and sphagnum moss. The pine bark is quite satisfactory, but not so the sphagnum moss. Seed germinates well on the sphagnum moss and little fungus develops even without the fungicide but the seedlings I find stagnate after they have been pricked out into my mix Number 4. However, for alternative views on the advantages of sphagnum moss see Leach (18) and Orr (19). The germinating medium is not critical; rhododendron seed germinates well on filter paper provided the paper and seed is kept moist. This filter paper technique is useful for germinating the seed while currently treating it with colchicine hopefully to induce polyploidy. This mix consists of moistened peat moss 50% and granulated polystyrene foam, Isolite, 50% by volume. This mix will keep for years in plastic bins and is easily mixed in a modified concrete mixer. I do not use it as a growing medium itself, but I keep a supply on hand and use it for making up other mixes some of which do not keep well, it being desirable that they are used within a few days of manufacture. This mix consists of moist peat moss 25% and Isolite 75% by volume made from mix Number 2 and with an addition of gypsum (calcium sulphate) 25g per gallon. It keeps well. I use this mix for rooting all rhododendron cuttings (6), (18) and also for simultaneous grafting and rooting (20) where it is essential that the stock has leaves on it. I do not have a system specifically designed for rooting cuttings and no doubt the optimum rooting medium depends on the particular setup. However, it is essential whatever the system that the rooting medium remain moist, becoming neither dry nor sodden. For hormone treatment, I use indolbutyric acid in talc frequently with Benlate or Bavistin added. The strength ranges up to 1.5% IBA for hard to root cuttings while for Vireya rhododendrons, most of which root easily, I use 0.2% IBA powder. I do not usually add borax (21). I apply bottom heat so that the temperature of the mix is 20° to 25°C (68°-77°F.) and I keep the mix moist and aerated. The use of small plastic thumb pots with open bottoms lets in air and makes it easy to see when roots have formed without disturbing the cutting. I water the cuttings in with Thiotox or Captan, at normal strength, which help to prevent rotting and may also encourage root formation. The tops of the cuttings are kept cool with occasional misting. No direct sunlight falls on the cuttings. I use an illuminance of about 5000 lux, which is rather low, and I suspect that 40,000 lux with intermittent mist would be superior. Once the cuttings are rooted, they are removed from the frame and stored for two weeks in a cool, low light area with no bottom heat and no fertilizer. Initially they are given a daily misting. Once the cuttings are brought into full light on the glasshouse bench they are given dilute Aquasol. Vireya rhododendrons are usually well rooted in 8 to 10 weeks, while Asian rhododendrons take rather longer. There are many alternative mixes; those which I have tried include peat moss and perlite 25%:75% and 50%:50% and various peat moss sand mixtures. The perlite mix is, I find, nearly as good as the Isolite mix and I frequently use it, but I cannot obtain the perlite as coarse as the Isolite and, I suspect, the drainage is inferior with the perlite I use. The sand mix I find less satisfactory, quite possibly because I do not sterilize the sand. I have only tried sphagnum moss (22) for rooting cuttings taken from small seedlings, the aim being to obtain a mature plant more quickly from the cutting than from the seedlings. I found sphagnum moss an unsatisfactory rooting medium for these small cuttings. I use this mix when pricking out rhododendron seedlings both Asian and Vireya. It is at this stage that I find most difficulty in growing rhododendrons, particularly Vireyas, the seedlings frequently cease to grow and after a while they rot. I am uncertain whether these difficulties are due to the mix or other conditions. I prick the seedlings out preferably when they are 1 to 2 cm high and put nine seedlings to a 75 mm square pot. The pots are watered once per week and misted once per day in the early morning. Additional feeding with dilute Aquasol starts after about one month. The illuminance is high by day at 5000 to 30,000 lux and the hours of light are artificially extended to 18 hours. I imagine that a peat-sand mix with sterilized sand would be equally satisfactory as far as growth is concerned, but peat-Isolite has the advantage that the pots are much lighter and thus easier to handle. The calcium carbonate lime is added to raise the pH of the mix rather than to supply calcium. It is with this mix that I think there is room for variability to suit particular rhododendrons, or perhaps a more suitable mix is required. My present plans are to try a 50:50 peat moss-Isolite mix with the peat moss put through a 6mm sieve. This increase in the percentage of peat moss brings the mix closer to that in which the seed germinated and in which the seedlings have been growing satisfactorily. The sieving should make the mix more uniform and allow seedlings to be pricked out when they are smaller. There may be some advantage in replacing the fertilizer with a weekly application of dilute Aquasol which can be adjusted to suit individual varieties. Rhododendron seedlings like to be together and have each other for company, or so it seems, so I do not repot the seedlings into separate pots until they are well developed and up to 50 to 200 mm high. The mixes discussed so far are propagating mixes, while the remaining ones are for somewhat larger rhododendrons that have become established and which are likely to be more than 15 cm high. The following applies to rhododendrons growing in containers. (i) Good drainage and sufficient porosity to allow the exchange of oxygen and carbon dioxide between the air and the roots. (ii) The medium must retain water which is available to the plant, it must have a suitable pH and the soluble salt level must not be too high. (iii) Macro and micro nutrients required by the plant during growth must be incorporated in the medium. (iv) The medium must produce adequate mechanical support to hold the plant upright. Provided the above four requirements are met, rhododendrons are not very fussy about the growing medium which can in fact be made from a wide variety of ingredients. 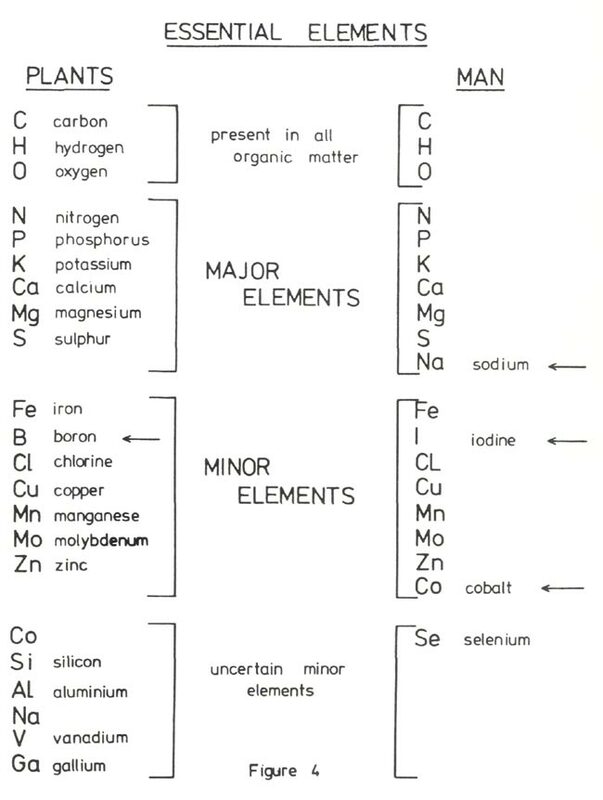 Figure 4 shows elements which are essential for plants (24) and for comparison elements which are essential to man. It is important that the fertilizer added to the growing medium contain these elements in suitable form and appropriate amounts. 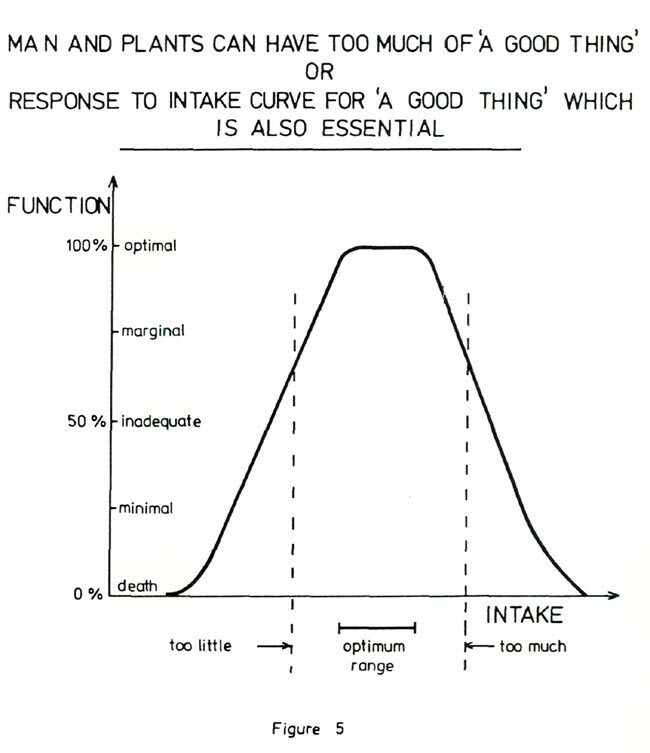 Figure 5 emphasizes the importance of not making the nutrient level too high. Even for an essential element there is an optimum amount available in the growing medium and an excess leads to a loss of function which can be as detrimental as a deficiency. For example, in rhododendrons, a slight excess of nitrogen results in lush growth, deep green leaves and no initiation of flower buds. As the excess of nitrogen increases the leaves become chlorotic due to an induced iron deficiency, followed by necrotic spots and margins, leaf shedding, die back and finally death of the plant. As an example in man an excessive protein intake leads to a loss of calcium from the bones with a resulting weakening of the skeleton (25). Dolomite 5 g per gallon. I use this mix for potting on rhododendron seedlings, Asian or Vireya into individual pots and for potting on rooted cuttings into 75 mm round or square pots. The plants are kept in a glasshouse out of the wind so mechanical support is not a problem. For additional quick release nitrogen and trace elements, I use Aquasol or Thrive at half normal strength. I am unable to obtain fritted trace elements or fritted potassium locally but if I could I would add them (26). This mix, as with all my mixes, contains gypsum. The importance of calcium to rhododendron health is explained and emphasized by Kerr (29) and Goheen (30). Gypsum does not alter the pH of the medium and is a convenient means of supplying calcium. It is not lime that rhododendrons hate, it is a high pH (31). Alternative mixes such as peat-moss-perlite and peat moss-sand are no doubt equally satisfactory. A further alternative (27) is the use of tree fern logs as a growing medium for Vireya rhododendrons. No further potting on is required or possible, as the log is chosen large enough to accommodate the plant when fully grown. The tree fern log makes an ideal medium; it provides excellent mechanical support, perfect drainage and aeration and suitable pH and water retention. It has the disadvantage that tree ferns are protected in Victoria both on Crown and private land (28) so that logs are difficult to obtain and, as well, while the plant is small, the logs require much more space than a pot. This mix is the same for potting on mix Number 5 but with the addition of pine bark both fines and coarse 10% to 20% by volume. I use this mix for potting on Asian and Vireya rhododendrons from 75 mm pots to 150 mm pots. The plants may then be put in the glasshouse or the shade house. Vireya rhododendrons frequently flower for the first time while in this size pot. In the shade house, the plants need support to ensure that the plant and the pot is not blown over by wind due to the lightness of the pot. I do not aim to keep rhododendrons in this size container indefinitely, so this is a holding mix. It is possible that in this mix, the fertilizer I use should be replaced with controlled or slow release fertilizers such as Magamp or Osmocote, so I plan trials of these materials in order to assess their potential. Care must be taken that the sawdust or buzzer chips do not come from cell cured timber which contains copper, chromium and arsenic in toxic amounts. Rhododendron roots certainly like growing into moist sawdust; it is only if the sawdust does encourage Phytophthora that it should be avoided. I consider manures unsuitable as an ingredient for container mixes. I use this variable mix for potting rhododendrons, usually Vireya, into 200 mm or larger containers, which then stand outside in the garden. These pots are automatically watered with a drip irrigation system (34). Large pots have up to three or four drips but the smaller pots are watered with just one drip. The single drip has the disadvantage that the water tends to wet primarily a vertical column in the mix directly under the drip, particularly if the mix is allowed to become too dry. Additional fertilizer is provided by including Kokei or Aquasol slow release pills during the warmer months. In all cases the container is mulched with coarse pine bark and plenty of stones are placed in the bottom of the pot to provide drainage and weight. I do not reuse or pasteurize any of my container mixes; discarded mixes go on the compost heap. When container mixes are pasteurized either chemically or with heat, Isolite may shrink, decompose or disintegrate. Under these circumstances, Perlite or sand should replace the Isolite. Pine bark 30 mm per m 2 . Because of cost, the pine bark is only added in those areas where I plan to plant Vireya rhododendrons. Cow or sheep manure is sometimes added and standard fertilizers are applied at appropriate times. In summer the ground is mulched (35) with pine bark for preference and otherwise pea straw or leaf mould. In some areas, I have added 'mountain soil' as a trial. This has made the ground too gluggy and rhododendrons have been lost due to some form of root or collar rot. It is sometimes said that there is a problem in planting out in the garden container grown plants (36). I certainly find this true of rhododendrons grown in mixes containing mountain soil when they are planted out in my garden beds. It is essential to wash off about half the mountain soil and mix it with the surrounding soil in the bed, otherwise the roots will not leave the ball of mountain soil. This is not a problem when planting out rhododendrons growing in my container mixes Number 6 and 7. I do not disturb the root ball and find that roots enter the surrounding soil without trouble. It is, however, important to note that mixes containing peat moss must not be allowed to dry out because they are so difficult to rewet, even using a non-ionic wetting agent, and the root ball of a newly planted out rhododendron can easily dry out even if the surrounding soil is moist. The CSIRO booklets 'Discovering Soils' (37) give much additional general information on Australian soils and garden soils and give details of techniques for improving the physical, chemical and biological properties of garden soils. K.A. Handreck and N.D. Black, Growing Media for Ornamental Plants and Turf N.S.W. University Press (1984). (1) K.F. Baker(Ed. ): The U.C. System for Producing Healthy Container-Grown Plants. University of California (1957). (2) H.A.J. Hoitink and A.F. Schmitthenner: Resistance of Rhododendron Species and Hybrids to Phytophthora Root Rot. Plant Disease Reporter 58 (1974) 650. (3) H.A. Hoitink and A.F. Schmitthenner: Control of Phytophthora Root Rot (Wilt) of Rhododendrons. Quart. Bui. Am. Rhodo. Soc. 26 (1972) 94. (4) E.G.W. Harrson: Rhododendrons and Honey Fungus. The Rhododendron and Camellia Year Book (1968) 200. (5) S.D. Garrett: Pathogenic Root-Infecting Fungi. C.U.P. (1970). (6) P.A. Cox: Dwarf Rhododendrons. Batsford (1973). (7) A Destructive Fungus in Australian Forests and More Trouble for Gum Trees. ECOS Number 15 February(1978). (8) C.J. Shepherd: Phytophthora Cinnamomi - An Ancient Immigrant to Australia. Search 6(1975)484. (9) H.D. Gordon: Mycorrhiza in Rhododendrons. Annals of Botany N.S. I (1937) 593. (10) J.L Harley: The Biology of Mycorrhiza. (2nd. Ed.) Leon. Hill (1969). (11) B.N. Richards: Introduction to the Soil Ecosystem. Longman (1974). (12) D.M. Griffin: Ecology of Soil Fungi. Chapman and Hall (1972). (13) R.G. Linderman: Mycorrhizae Enhance Rooting of Cuttings. Quart. Bul. Am. Rhodo. Soc. 31 (1977) 236. (14) J.M. Trappe: Selection of Fungi for Ectomycorrhizal Inoculation in Nurseries. Ann. Rev. Phytopathol. 15 (1977) 203. (15) P.G. Valder: The Life Cycle of a Rhododendron. The Rhododendron 10 (1971) No. 1 Page 3 & No. 2 Page 11. (16) P.G. Jordan: A Modern Method of Propagating Rhododendrons from Seed. Quart. Bul. Am. Rhodo. Soc. 27 (1973) 220. (17) D.W. Johnson: Growing Rhododendron Seedlings Indoors under Artificial Lights. Quart. Bul. Am. Rhodo. Soc. 32 (1978) 23. (18) D.G. Leach: Rhododendrons of the World. Allen and Unwin (1962). (19) P.B. Orr: More about Rhododendron Seedlings in Sphagnum Moss. Quart. Bul. Am. Rhodo. Soc. 29 (1975) 158. (20) J. Eichelser: Simultaneous Grafting and Rooting Techniques as Applied to Rhododendrons. Combined Proceedings of the International Plant Propagators' Society 17 (1967) 112. (21) C.E. Hess: Propagation - Past, Present and Future. Quart. Bul. Am. Rhodo. Soc. 24(1970) 202. (22) B. Clancy: Three New Ideas. The Rhododendron 13 No. 3 (1974) 8. (23) A.W. Flegmann and R.A. George: Soils and Other Growth Media. MacMillan (1975). (24) E.J. Hewitt and T.A. Smith: Plant Mineral Nutrition. Fletcher (1975). (25) W. Mertz: Nutrition and Health: The Role of Nutrition Research. Search 7 (1976) 469. (26) F.R. Davis: Why Micronutrients in Plant Nutrition? Quart. Bul. Am. Rhodo. Soc. 28 (1974) 33. (27) B. Clancy: Rhododendrons in Fern Logs. The Rhododendron 12 No. 4 (1973) 11. (28) Wild Flowers and Native Plants Protection Act 1958. Victorian Government Gazette No. 36 dated 11th May, 1977. (29) A.E. Kerr: What's New in 1972. Quart. Bul. Am. Rhodo. Soc. 26 (1972) 223. (30) D. Goheen: Rhododenutrition. Quart. Bul. Am. Rhodo Soc. 30(1976) 122. (31) A.R. Cook: Lime and Rhododendrons. Quart. Bul. Am. Rhodo. Soc. 30(1976) 246. (32) G.C. Morrison: Charcoal as a Compost. Australian Orchid Rev. Dec. (1973) 181. (33) P.B. Orr: The Use of Sawdust as a Fertilizer of Rhododendrons. Quart. Bul. Am. Rhodo. Soc. 29 (1975) 10. (34) K. Shoji: Drip Irrigation. Scientific American Nov. (1977) 62. (35) P. Rowe-Dutton: Mulching is Important. R.H.S. Garden 101 (1976) 135. (36) J.E. Cross: After Planting Care of Container Grown Plants. The Rhododendron 14. No. 3 (1973) 12. 1. Soils, An Outline of their Properties and Management. 2. Soil - Australia's Greatest Resource. 3. Composting - Making Soil Improver from Rubbish. 4. What is Wrong with my Soil? 5. Earthworms for Gardeners and Fisherman.